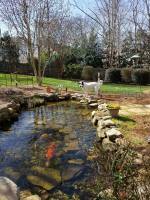 Water features such as koi ponds, water gardens, streams, fountains, and waterfalls have become the hottest landscaping trend in America today! Not only do they provide a tranquil and relaxing garden atmosphere for the homeowner, but also add an entirely new dimension to the property. 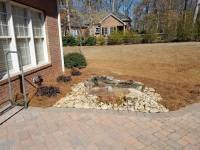 Water features, like other types of landscaping, mature with age, and increase the value of your property more than any different kind of home improvement. 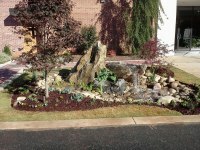 Today's water gardens are environmentally friendly and completely customized to be installed anywhere. 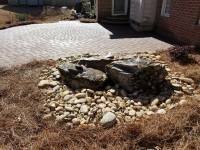 Landscapes Unlimited specializes in designing and constructing beautifully aesthetic, energy efficient, and low maintenance ponds and water features that are customized to fit your particular style and taste. 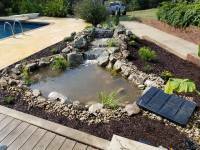 Transforming your property into an exotic underwater world, working with mother nature in creating water gardens that are beautiful and relaxing. Imagine your everyday lifestyle enhanced with the vibrant colors of exotic fish and the soothing melody of running water. Start your morning by looking out your window and seeing cascading waterfalls, flowing streams, and end your day with the relaxing sounds of a babbling brook and the soothing aroma of night blooming lilies. 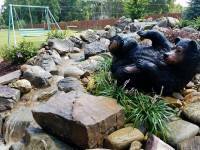 So go ahead and give us a call and start experiencing tranquility that transcends today's stressful world. 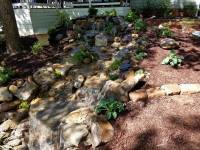 Water Fountains has been an essential element in gardens for hundreds of years. 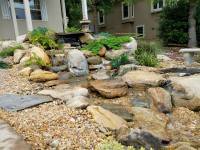 The soothing sound of moving water is one of the most relaxing parts of any garden design. 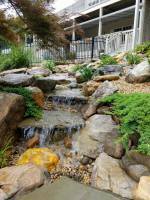 Landscapes Unlimited can create a waterfall from beginning to end. 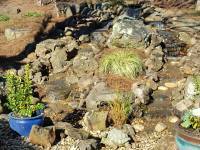 We can also refurbish or repair an existing water feature and instruct you on how to maintain your water features. Please call our designer today for a free quote.